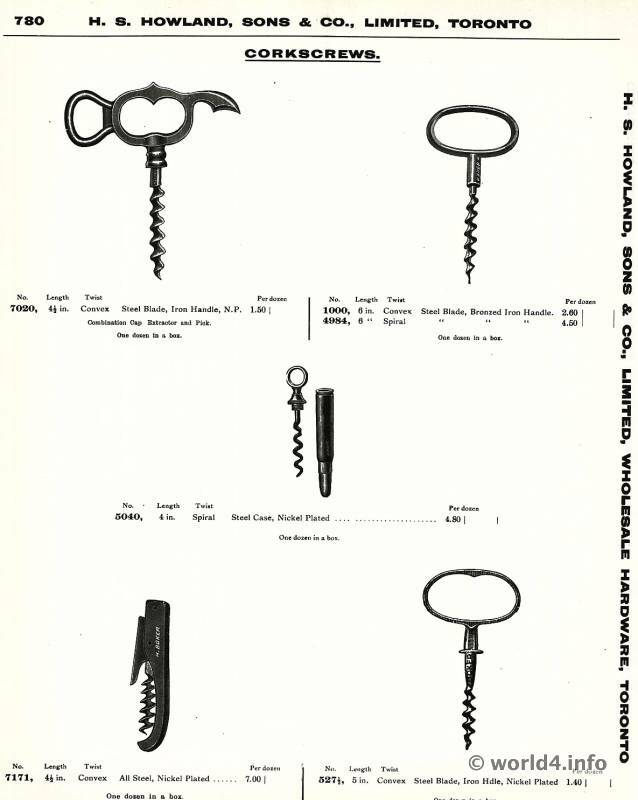 Corkscrews by H.S. Howland, Sons & Co., Limited, Toronto. 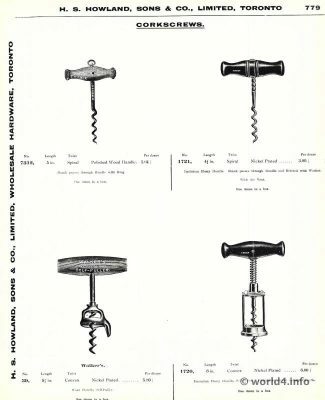 Old corkscrew design of the early 20th century. Manufacturer was the company H.S. Howland, Sons & Co., Limited, Toronto. Published by the company C. B Hamm of Queensboro, Ontario on June 21, 1923. A few corkscrew models are identical in part to the design around 1840. Corkscrew No. 7020, Length 41/2 inch, Twist Convex, Steel Blade, Ironhandle, Combination Cap Extractor and Pick. No. 1000, Length 6 in. Twist Convex/Spiral, Steel Blade, Bronzed Iron Handle. No. 5040, Length 4 in. Twist Spiral, Steel Case, Nickle Plated. No. 527 Length 5 1/2 in. Twist Convex, Steel Blade, Iron Handle, Nickle Plated. No. 1721 Length 4 1/2 in. Twist Spiral, Polished Wood Handle, Nickle Plated. Imitation Ebony Handle. Shank passes through Handle and with Washer. 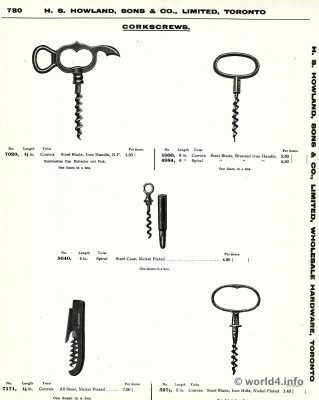 Corkscrew Walker`s No. 39, Length 5 1/2 in. Twist Spiral, Nickle Plated. Wood Handle, Self Puller. No. 1721 Length 6 in. Twist Convex, Nickle Plated. Imitation Ebony Handle, Self Puller. Attachment pinned through Handle. Art Nouveau Ornaments - Tendrils, Flowers, thistle. Art Nouveau Ornaments - Graphic Design, Art deco Period 1910.